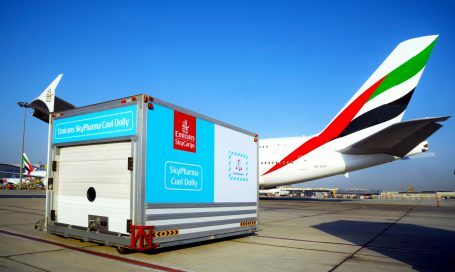 Emirates SkyCargo, the freight division of Emirates, has received yet another industry accolade for global excellence in transporting temperature sensitive pharmaceutical products. The air cargo carrier was the recipient of the DHL Carrier Award for Reliability and Excellence (DHL CARE) presented at the 17th Global Life Sciences & Healthcare Conference organised by DHL in Singapore. The award was accepted by Jeffrey Van Haeften, Emirates Vice President, Global Cargo Sales. The DHL CARE awards were inaugurated in 2016 and recognise air cargo carriers whose services set the industry standard for the transport of temperature sensitive pharmaceutical and life sciences products. DHL evaluated air cargo carriers over a number of criteria including shipment quality, ground handling expertise and innovation in both the technology and process of shipping for the awards. The award is an important recognition for Emirates SkyPharma – Emirates SkyCargo’s complete solution for transporting temperature sensitive pharmaceutical shipments. Emirates SkyPharma encompasses three levels of innovative transport solutions that can be selected by customers based on the temperature sensitivity of the pharmaceutical product being transported, packaging solutions used and the origin and destination of the shipment. The solutions are backed by state of the art facilities – including a GDP certified pharma dedicated facility at Dubai International Airport and innovative solutions including the Emirates SkyPharma Cool Dolly and White Cover Advanced. Emirates SkyCargo also works with leading global providers of containers to offer customers a wide choice of specialised temperature controlled containers for shipping their products. Since its launch in 2016, Emirates SkyPharma has been well received by customers across the globe and this has resulted in increasing volumes of pharmaceutical shipments across Emirates SkyCargo’s global network of over 155 destinations across six continents. One of the origin points that has witnessed the strongest growth in 2017 for Emirates SkyCargo for pharma shipments has been Singapore. Singapore hosts a growing cluster of pharmaceutical and life sciences companies and Emirates SkyCargo has been working with a number of pharmaceutical research and manufacturing companies and associated freight forwarders in the region to offer bespoke transport solutions for their temperature-sensitive pharmaceutical products. As part of its initiatives in the region, Emirates SkyCargo organised a pharma-focused workshop for manufacturers and freight forwarders in Singapore in November last year to present the air cargo carrier’s specialised product offerings for pharma customers. As a result of collaborative efforts the volume of pharma shipments from Singapore through Emirates SkyCargo this year has witnessed a 30% month on month growth and is poised for higher growth in the coming months as well. Emirates SkyCargo continues to work with stakeholders in the global pharmaceutical and life sciences sectors to develop increasingly sophisticated solutions for the secure and timely transport of temperature sensitive pharmaceutical goods.